How Will Payrolls Be Affected by Good Friday? Yhe first question that comes to mind is how the Good Friday holiday could affect volatility in the currency market. Holidays usually mean less liquidity and less volatility but when there is a piece of economic data scheduled for release as important as non-farm payrolls, less liquidity could mean greater volatility. The last time that non-farm payrolls was released on Good Friday was in 2007. At the time, the market was looking for payrolls to rise by 130k but it rose by 180k, beating the market’s expectations by 50k. The following 5 minute chart of the EUR/USD shows how the currency pair traded in the hours after the release. We can see that the dollar jumped approximately 50 pips immediately after the announcement, consolidated for the first hour, then pushed slightly lower the hour after that and then consolidated for the rest of the day. Typically we see a “V” shaped price action after the payrolls report which we have written about month after month. 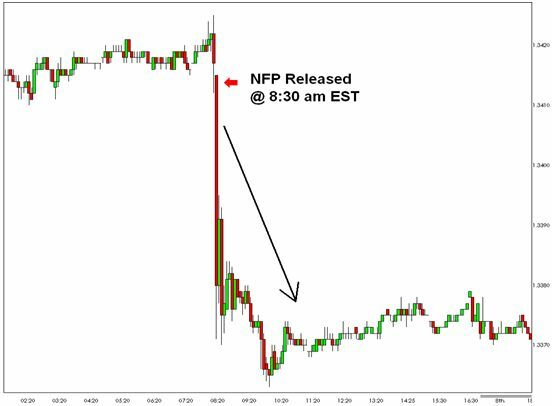 The reason why there tends to be a V shaped price action in the EUR/USD is because the forex markets respond one way to the NFP report and equity markets respond another. However this month the U.S. equity markets are closed which means that the initial reaction in the EUR/USD should last and volatility should settle 2 to 3 hours after the NFP release.